Three crew members returned to Earth just before three more launched to the International Space Station to continue work on the hundreds of experiments happening aboard the orbiting laboratory. NASA astronaut Scott Tingle and crewmates Anton Shkaplerov of the Russian space agency Roscosmos and Norishige Kanai of the Japan Aerospace Exploration Agency (JAXA) landed in Kazakhstan on Sunday, June 3. Three new crew members – NASA astronaut Serena Auñón-Chancellor, Alexander Gerst of the European Space Agency (ESA), and Sergey Prokopyev of Roscosmos– joined the ranks of Expedition 56 Friday morning. Ahead of the arrival of the latest crew members, the remaining trio conducted research in the fields of plant biology, human research and physical science. Understanding how plants grow and thrive in harsh environments, both on Earth and in space, is important for advancements in agriculture. 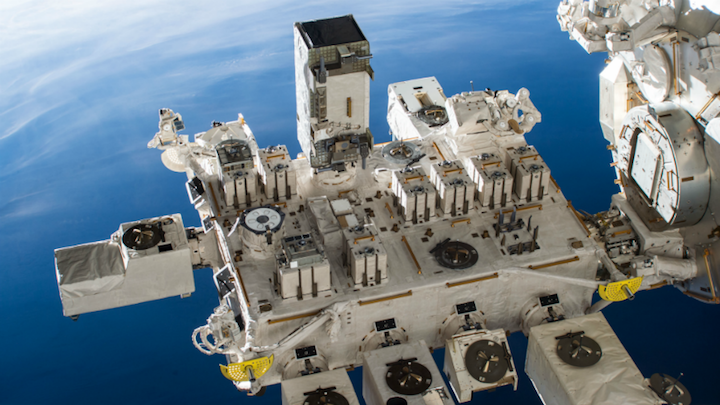 The Advanced Plant Habitat Facility (Plant Habitat) is a fully automated facility used to conduct plant bioscience research and provides a large, enclosed, environmentally-controlled chamber aboard the space station. The APH also has an upgraded LED system that goes beyond the red, blue and green LEDs used at low, medium and high settings in the Veggie plant habitat. APH is equipped with white, red, blue, green, and far red LEDs and has a wide variety of settings capable of producing light from zero to 1,000 micromoles, a unit of measurement used to describe the intensity of a light source. By expanding the spectrum of light, researchers can broaden the types of plants they study in space and tailor the light to that plant’s unique needs because each of the lights within APH can be set to any level within that range. APH also provides the first true foray into studies involving space-based agricultural cycles. “Not only can we grow small plants, but we will be able to grow seed to seed” said Onate. This means that an entire line of plants could be grow from one seed brought from Earth, creating generations of offspring destined for life among the stars. “If we can get seeds that are viable in space and grow multiple generations from that one seed, that’s a new capability. And we now have the space to do that kind of testing with APH. We’ve tried to create a little Mother Earth,” adds Onate. The APH supports research solicited through NASA Research Announcements (NRAs) that are designed to meet NASA’s goals for the successful completion of exploration missions and the preservation of astronaut health throughout the life of the astronaut. In addition, the facility is available to support commercial and academic U.S. National Laboratory investigationssponsored by the Center for the Advancement of Science in Space. Want to learn more about this and other science investigations aboard the orbiting laboratory? Follow us @ISS_Research. For opportunities to see the space station pass over your town, check out Spot the Station. The Electrostatic Levitation Furnace (ELF) is an experimental facility designed to levitate, melt and solidify materials by container-less processing techniques using the Electrostatic Levitation method. With this facility, properties of high temperature melts can be measured, and solidification from deeply undercooled melts can be achieved. This week, the crew moved samples to prepare for upcoming ground commanded operations. Results from this investigation may contribute to the development of containerless processing technology, benefiting manufacturers and scientists designing new materials. The space station the only spacecraft orbiting the Earth. In fact, it is accompanied by the Hubble Space Telescope, satellites within the Earth Observing System, and more than 1,000 other operational spacecraft and CubeSats. In addition to spacecraft, bits of orbital debris – human-made objects no longer serving a purpose in space – are also in orbit. NanoRacks-Remove Debris (RemDeb) demonstrates an approach to reducing the risks presented by orbital debris by using a 3D camera to map the location and speed of debris, then deploying a net to capture and de-orbit simulated debris up to 1 meter in size. A view of the JEM External Platform. Soon, the NanoRacks-Remove Debris investigation will be deployed from the JEM Experiment Airlock later this month. This week, the crew prepared the satellite for deployment by removing the launch panels and protective coverings, attaching the Kaber deployer system to the satellite, then attaching the satellite to the Airlock Adapter Plate on the JEM Airlock Slide Table before retracting the Slide Table back into the Airlock and closing the hatch. The satellites deployment is planned for June 19. Other work was done on these investigations: Atomization, Probiotics, NICER, Food Acceptability, SUBSA, ICE Cubes Facility, Manufacturing Device, Wireless Compose, SABL, CEO, ASIM and Functional Immune.